Today [first published 18 December 2012] marks a century since the official presentation to the Geological Society of London of what was later to be revealed as one of the most notorious hoaxes in the history of science. 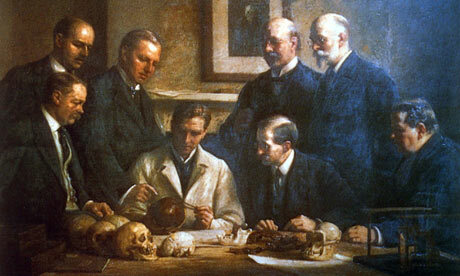 This was Piltdown Man, initially accepted by many as the fossil remains of an early human. The hoax, created by combining parts of a medieval human skull with the lower jawbone of an orang-utan, was only exposed in 1953. While doubts had certainly arisen, within Britain at least, the hope that an Englishman had found in Sussex support for Darwin’s theory ofevolution, and backing for the conventional view that human evolution had been led by the development of a larger brain, created a climate in which the claim was largely supported. The specimen was, therefore, given a Latin name: Eoanthropus damson (Dawson’s dawn man, after the collector and almost-certain hoaxer Charles Dawson). E dawsoni was not the only species that Dawson conjured into reality. Back in the 1890s, Dawson had announced the find of the teeth of what appeared to be a missing link between reptiles and mammals. This too gained sufficient credibility to be given a scientific name: Plagiaulax dawsoni. Although the specimens were forgeries, the fact that they were named, illustrated, published and discussed meant that the species nevertheless achieved some sort of existence, at least for several decades. It feels a little as if there should be some sort of limbo, perhaps similar to the place that ballpoint pens and odd socks go, reserved for these phantom species. It would be a crowded place for, when you stop to count, there are a large number of these non-beings, usually enjoying a brief virtual existence before being re-identified as a variant of a known species or a simple mistake. Most have little impact: the ones we recall are those that generated much enthusiasm and controversy. I came across an example of the latter in an essay by Anne Flore Laloë, included in a collection published earlier this year. This was a supposed creature identified by Thomas Huxley. Like Dawson’s two “missing links”, Huxley’s Bathybius haeckelii was a much-desired link between inorganic matter and organic life. It was “discovered” in 1868 when Huxley re-examined samples of mud from the Atlantic seafloor, taken a decade before during the sounding work done in preparation for the laying of telegraph cable. Huxley spotted what appeared to be a veined, albuminous ooze, having “so far the attributes of a Vegetable, that it is able to elaborate Organic Compounds out of the materials supplied by the medium in which it lives, and thus to provide the sustenance for the Animals imbedded in its midst”. The name of Huxley’s new species was given in honour of Ernst Haeckel, who had suggested the existence of Urschleim (primordial slime) as the origin of all life. This was a discovery, rather like the more recent “arsenic life“, that created considerable excitement. However, while arsenic life was quickly and successfully challenged, it turned out that B haeckelii was to enjoy a more prolonged existence, turning up in the South Atlantic and Indian Ocean before being shuffled off to the phantom species limbo by John Young Buchanan of the Challenger expedition in the 1870s. Such stories have been used by creationists to suggest that supporters of evolution are either easily duped or untrustworthy fraudsters. It cannot be denied that when a phantom species becomes famous, it is likely to be fulfilling a role or roles much desired by at least part of the scientific community – filling a theoretical gap, providing proof of common assumptions, flattering national pride or justifying new research funding. However, while there have been a handful of hoaxes, it is usually perfectly good science, intermixed as it necessarily is with theoretical expectations and cultural assumptions, that creates, sustains and then banishes phantom species. Just like other ideas – phlogiston, universal ether, quintessence, gravitational vortexes and, likely, dark matter and string theory – they are products of, and spurs to, the development of science. My Easter break took me to Dorset’s Jurassic Coast for a few days of walks, searching for fossils on the beach and skipping showers by heading into second-hand book shops and little museums. The weather, and the light, were gloriously changeable. Both of these images were taken at West Bay, near Bridport, one on and the other below the strikingly golden sandstone cliffs. The museums, despite being of fairly similar size, were equally variable. All had something to offer, and evidently had enthusiastic staff and good relationships with local schools, but differences in funding (perhaps), the imagination and knowledge of curators (probably), the possibilities of the location (certainly) and use by visitors all played their part in making our visits more or less engaged. The common themes, unsurprisingly, were the area’s relationship with the sea and the unrivalled geological heritage. There were more ammonites than several sticks could be shaken at, and more than a handful of Mary Annings. Anning, of course, was the 19th-century Lyme Regis woman who followed her father into business as a vendor of fossils, making her name with a series of extraordinary finds, including an ichthyosaur skeleton when she was only 12. Anning’s sales were not just to visitors and local school children – although they bought from her shop too – but to the metropolitan geological elites, like Henry de la Beche, William Buckland and Richard Owen. These and many other visiting geologists were shown around the beaches, learnt the tricks of the trade and gained from the knowledge of Miss Anning. Of the three main museum visits we made, perhaps the most disappointing was the Dinosaur Museum in Dorchester. To be fair, we visited on a very wet Easter Monday with a ton of other kids and parents, but its rather Jurassic Park-style flyers and fairly hefty entry price led us to hope for more than a series of rather disorganised rooms with dog-eared labels and interpretation panels in various styles crowding the walls. There were useful attempts to reach a range of learning styles – lift-up things, feel-inside things, listen-to-things, films, computer displays – but it felt a little as if each new idea was thrown into the mix, lacking a sense of general approach or coherence. The same was true for real fossils, replicas and models, meaning that the most important artefacts could get completely lost. A quieter day, or a more organised visit, might, of course, do a great deal more with everything that was there. On the same wet day we also took in the local history-focused Bridport Museum. This was bound to be a winner for me as it told the story of Bridport’s rope and net-making industries (in which my grandfather had worked for decades), although it was, perhaps, a little too book-on-the-wall, text-panel heavy. The main gallery was, however, complimented by a newer display focusing on oral history. 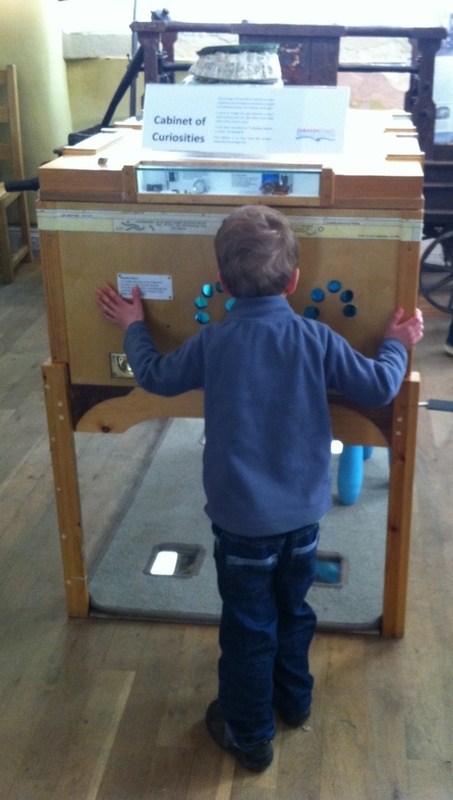 The small room of fossils worked for my son – some touching allowed, but an uncluttered and impressive display. Upstairs, small collections of flint tools and Roman artefacts gave a sense of the long history of the area. Slightly randomly, the neighbouring rooms included local sporting activities, coastal erosion and costume but, I guess, this the the eclectic joy of a local history collection and small museum. The bonus was that it was all free – which meant, in fact, that we came back for a second visit. My favourite visit, perhaps predictably, was to the Lyme Regis Museum. It is a wonderfully eccentric building, in a lovely town, with fantastic links to science, art and literature. The quality of displays is reflected in the website, which allows a full tour of the galleries. It is, as it always has been, largely volunteer-run but the more-than-100-year history of the place, and the interest of both visitors and locals in Lyme, its landscape and history, have created a lovely museum experience. As their website says, “Our collections are unusually rich for a small museum and we have a lot of good stories to tell”. Three stories stick with me. One, of course, is Mary Anning’s life, work, collections and connections (you’ve got to love a table made of fossilised poo – thanks Miss A and Dr Buckland! ), another is part of the museum’s own history, with its curator John Fowles, author of The French Lieutenant’s Woman, and, finally, there was a display relating to shipwreck and rescue, which brought home the ordinary danger of living with the sea. It goes to show what good imagination and research can achieve in a very small space. It was definitely not just for kids, although the size and height – and the ability to get underneath it – certainly made them feel it was designed especially for them. Geological collecting perhaps lends itself particularly well to the cabinet conceit, but I suspect that it would be a fun, and probably useful, exercise to think about how any topic might be presented in a similar way. Every home/museum/school should have one!